Websites using Crisp may create their own status page via Crisp Status Page. It automatically monitors configured nodes from your infrastructure, and notifies your team when a service gets down. The Status Page feature is available in Crisp Unlimited. You need to make sure your website is subscribed to that plan so that you can use the Status Page feature. How to create my Status Page? Then, your Status Page will be available online shortly. Allow a few minutes for the SSL certificate for your Status Page domain to be generated. Then, your online status page will be ready (you will be able to configure monitored services & nodes). How to customize my Status Page? Click on "Customize your Status Page"
You can customize the Status Page header and footer logos with your own brand logo. In the "Customize your Status Page" settings, look for "Header logo" and "Footer logo". The main color of your Status Page is based on the color of your Crisp chatbox. If your chatbox is set to be blue, then your Status Page will be blue. If you want to change the color of your Status Page, you will need to change the color of your chatbox. Read this article on how to do it. Colors set in the Crisp customization plugin are used as the color of your Status Page too (if any is set). If your chatbox has a pattern image configured (ie. the subtle pattern you see as the background of your chatbox), this same pattern will be used in the header of your Status Page. If your chatbox has no pattern configured, then your Status Page won&apos;t have any used too. You can also upload a custom header background image from the "Customize your Status Page" settings. Make sure to upload an image that scales well on large screens. How to set a custom domain for my Status Page? By default, Crisp provides an hosted Status Page domain (eg. acme.crisp.watch). However, it is possible (and recommended!) to configure a custom Status Page domain (eg. status.acme.com). Once the domain change is validated, a new SSL certificate for your Status Page will be generated. This may take up to 2 minutes. Check your newly configured domain after this delay. How to configure services & nodes? Crisp Status groups monitored nodes (eg. a website, an HTTP API endpoint, the TCP socket of an email server) in services. A service is a group of nodes, that typically run for the same purpose. You may create a service named "Websites" to monitor all your website domains. 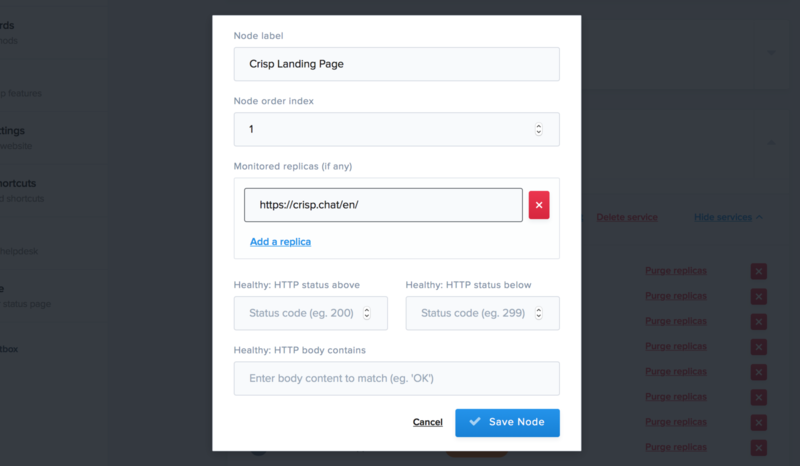 Click on "Add a new Service"
Click on "Add a new Node"
In the new replica field, enter: "https://crisp.chat/en/"
Your replica will be grey while it&apos;s pending for a check. Crisp Status does a check of all poll nodes every 2 minutes (120 seconds). Check back in a maximum of 2 minutes to see the actual replica status. You can order your services and nodes by editing them after adding them, and giving an order number from 1 to 100. Lower number comes first in list. Which monitoring modes are available? Poll mode: used to monitor HTTP/HTTPS and TCP services. HTTP health is checked using HTTP status codes. Crisp Status polls the service to check for its status. Push mode: used to report the health of application servers. Install a library in you eg. NodeJS project. The application reports its status by pushing it to Crisp Status. Read more on how to setup push mode. Local mode: similar to poll mode, but used for local and LAN nodes that cannot be reached via the public Internet (eg. a MySQL server). The status is checked by a provided daemon, installed on a server of yours, which then forwards the results to Crisp Status. Read more on how to setup local mode. A replica is the ultimate unit to have a status / health attached to it. A replica is the endpoint that&apos;s being monitored, whether it be an HTTP / TCP host or an application. Healthy — The replica is responding fast and is not overloaded. Sick — The replica is slower than usual (network slower, system overloaded). Dead — The replica did not answer last probe requests and seems to be down. Each status has its health color code. healthy is green, sick is orange and dead is red. This lets people quickly identify what&apos;s happening. A node takes the worst status of its replicas. A service takes the worst status of its nodes. The Status Page takes the worst status of its services. In other words, if a single replica shows as dead, your whole Status Page will show as dead. Same for sick. If no replica either shows as sick or dead, your Status Page will show as healthy. How to change monitoring bot options? You can alter the way your monitoring bot behaves on each type of node (ie. node mode). Number of times to retry a failed check: when a check fails, retries this number of times before considering the replica dead (if it does not answer in due time). Seconds after which node is dead: consider a replica dead after this number of seconds (ie. if it takes longer than this duration to respond). Seconds after which node is sick: consider a replica sick after this number of seconds (ie. if it takes longer than this duration to respond). How to receive downtime notifications? When a replica goes down (ie. its status changes to dead), you can get notified across a few notification channels. You can use none, all at the same time, or a few ones only. Here&apos;s how to configure each. The email channel is the most convenient way to receive downtime notifications to your email inbox. To configure the email notifier, open up the "Email (to address)" category, toggle on the notifier, and fill in a target email address. The Slack channel lets you receive downtime notifications in a Slack #channel in your team. This lets Slack team members opt-in to notifications, or opt-out from them at any time. To configure the Slack notifier, open up the "Slack (to channel)" category, toggle on the notifier, and fill in your Slack Web Hook URL. Read how to get a Web Hook URL. The push notifier sends direct notifications to your connected Crisp apps (eg. Crisp iOS app), to selected operators from your team. It is a no-brainer way to receive your downtime notifications. To configure the push notifier, open up the "Push (to operators) category, toggle on the notifier, and pick the operators you want to be notified. How to receive status change Web Hooks? When your status page general health changes (eg. 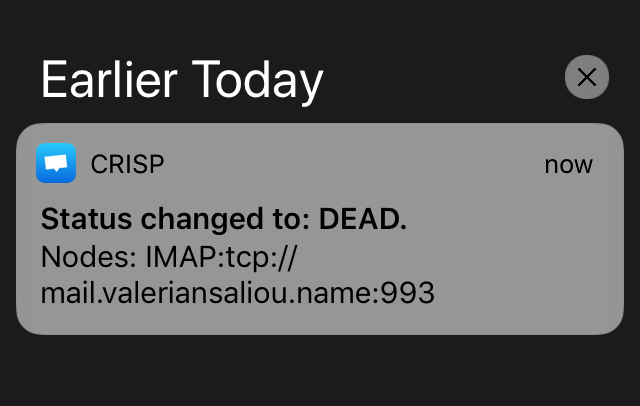 goes from healthy to dead), you can configure Crisp to send a Web Hook to your servers. You can then implement custom actions on your end. In case of prolonged downtime, or planned maintenance, it&apos;s usually a good practice to show an announcement message for all your users. The announcements is made public on your status page. An announcement can be set to expire at a certain date. It can be useful for planned maintenance, as you know approximately when it is most likely to end in time. When your systems go down, it&apos;s usually a good idea to show a warning to all your users before they flood your Crisp customer support of questions or hate chat messages as you&apos;re busy getting everything back in order and probably not answering in due time. By default, when your Status Page reports as Dead for more than 3 minutes in a row, a warning will be visible on your Crisp Chatbox, and your Crisp Helpdesk (if you are using it). If you don&apos;t like it, you can tell Crisp Status not to show a downtime announcement either on your chatbox, helpdesk, or both. Check for relevant settings in your chatbox settings (where other chatbox settings are), or helpdesk settings (where other helpdesk settings are). Where can I find Crisp Status utilities? To monitor push mode nodes, you&apos;ll need to setup a Crisp Status Reporter library. See instructions in this article. To monitor local mode nodes, you&apos;ll need to setup the Crisp Status Local service (also called daemon). See instructions in this article.